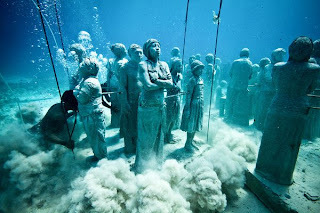 British artist Jason de Caires Taylor created a miracle in the Marine Park Punta Cancun, Isla de Mujeres, Punta Nizuc in Cancun, Mexico. 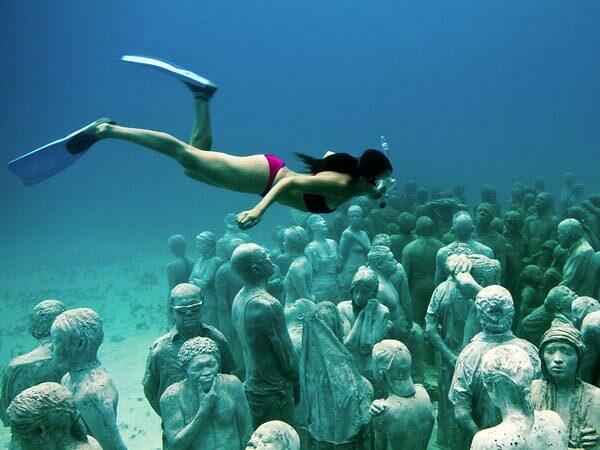 In the waters of the coast, hundreds of statues of life-size ready as sightings of ghosts 27 meters below the surface. These articles became the latest addition to the rides in a new Museum under the water in the Marine National Park of Cancun. In a project called " The Silent Evolution ", Taylor creates underwater sculpture park, which also acts as an artificial reef. Taylor's like juggling sea into an art gallery by placing a statue of the number 400, which took models from local residents. As reported by the Guardian, in addition to attracting tourists, the project also aims to conserve marine habitats. Taylor explained, during this natural reefs around Cancun damaged by pollution and exploitation of fish. Artificial coral reefs are also expected natural 'break' above to 750.000.000 tourists visit each year. The sculptures are also expected to help production of coral reefs and interesting variety of aquatic animals Cancun. The sculptures are made from a special type of cement which is 10 times harder than normal type and has a neutral pH, which is beneficial to corals. Statue of fiberglass reinforced by rigid with properties similar to the reef so that they remain in place. To place the sculptures in the depths of the sea floor 10 meters, it takes a special drill drilling, mixing and weighing more than 120 tons, it is expected that the new reef will be able to withstand storms and hurricanes that regularly hit the region. Variations of fish and other sea creatures in the Caribbean Sea will be maintained continuity in artificial habitats. "This is an exhibition that will never be boring, because it was destined to become an ever changing," he said.